We're OK here in Binan. The typhoon was very noisy, flooded a few areas and knocked over some trees, but otherwise Binan is relatively untouched. The real trauma is down in the southern part of PI. Latest predictions to my knowledge have been more than 10,000 dead. That's all for this post. Just wanted to let everyone know we're OK. Go hug someone you love while you can. 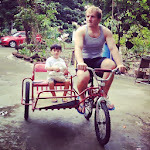 An American expat, husband, father, and amateur blogger adjusting to a new way of living in the Philippines. Butchering the Tagalog language, one sentence at a time. Kasal sa aking asawa, "Jing," at pagtataas ng dalawang lalaki.